That is the only word worthy of this event. Just moments after they heard the Father’s voice introducing His son, their eyes were drawn upwards. What they saw defied description. A man, dressed in emasculate white, was descending towards them. How could this be? Who could this be? The question of how became irrelevant. 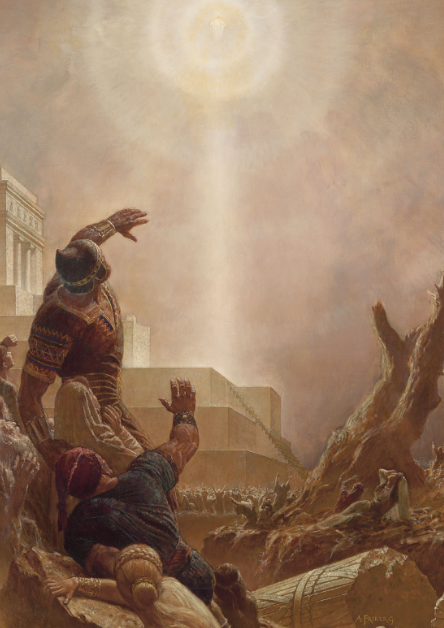 The question of who was answered as soon as He set foot on the steps of the temple. All their lives they had been taught about Him, read about Him, and sang about Him. In the horror of the storms and the awfulness of those darkened days they begged for His rescue. 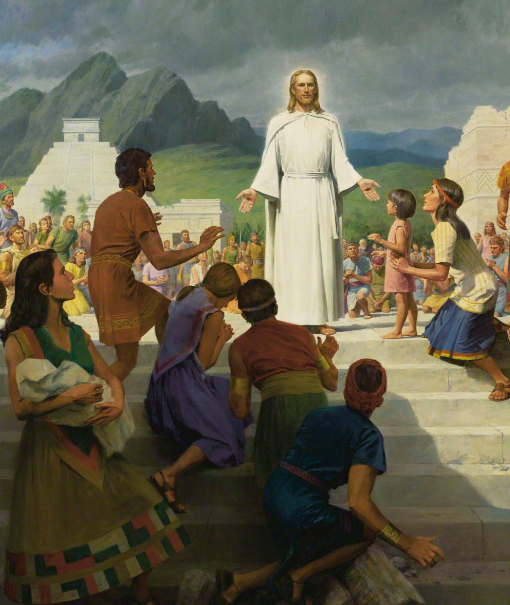 Now He was standing there – on the steps of the temple. He was no longer a concept to have faith in, no longer a faceless God. He was right there, standing in front of them. 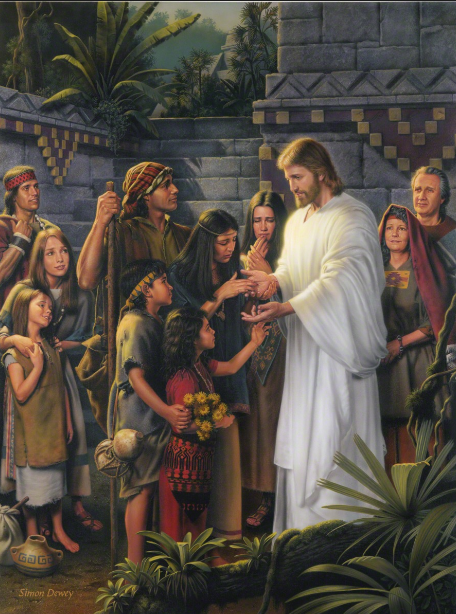 He spoke to them about being the Light of the world. He talked of a bitter cup. 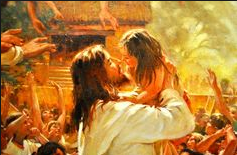 He told of suffering the will of the Father while taking upon Himself the sins of the world. Marvelous and wonderful things He told them while standing right there in front of them. But Jesus could tell they were not entirely focused on what He was saying. Rather they were focused on Him. He paused his planned message and asked the people to come to Him. He desired to have them feel the prints of the nails in His hands, wrists, and feet. He encouraged them to thrust their hands into His side where that cruel Roman spear pierced His once lifeless body. But no one came forward at first. No one dared. Their hands were dirty with the grit and grime from clearing the rubble. Their bodies were drenched in sweat. Their clothes were tattered and torn. 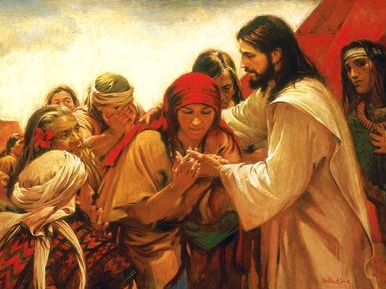 Surely, Jesus did not want them to touch Him in His divine purity. They stayed back, reluctant to accept His gracious invitation. So, Jesus moved towards them. He picked up a nearby child. He put His hand on the shoulder of an aged man. He bent down and cupped the face of a teenage girl. By doing this, Jesus broke the barrier and the people came forward. They all came – young, old, sick and injured. In spite of their humble appearance, their unclean hands, and their dirty faces, they all touched Him. Hosanna! Blessed be the name of the Most High God! Those in the front of this crowd, closest to Jesus, looked up at Him and saw tears running down His cheeks. Finally, He was accepted for the God that He was. At last, He was bathed in the warmth of sincere love. The God who created this world, spoke to the prophets, and atoned for all our sins was finally felt loved and appreciated for who He was.